I remember sitting in my mother’s room glued to MTV, back when it was basically a TV station full of magical things. Heavy D and the Boyz came on and I got up to dance, jumping all around, bumping dressers and whatnot. I knew his music because I saved up my allowance and went and bought a bootleg cassette of “Peaceful Journey” from the liquor store. Now that we found love, was on. My mother walked in and saw Hev in that red suit, dancing like mad, and lost it. And that was it. She was hooked. She would let me play “Peaceful Journey” in the car, and when “Nuttin’ but Love” came out and I got it (from the liquor store) she practically stole it for herself! Hev was her man! He had a way of being positive without being corny. He gave big boys a lot of confidence, and a song like Black Coffee means a whollllllee lot now when it comes to how we feel about Black women. A few months ago I was asked by my homeboy to help write a song for Heavy for his latest project. My friend was working with him and decided I would be a good fit when it came to giving him a fresh sound, etc. What a dope opportunity, though I never got to meet him and none of my songs were picked for the record. 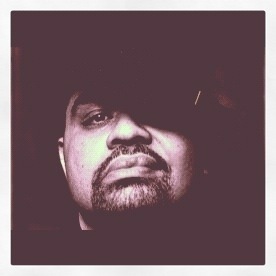 Heavy D, you were a major part of my youth. I copied your dances and was mesmerized by the diddly dee. You made us feel good, during a time where hip hop was our light and our megaphone. Everybody loved you. I remember how shocked I was when I saw you in Biggie’s “One More Chance” video, on some “I ain’t know they knew each other!” And most importantly, you convinced my mom to give it a chance. Thank you. NYC! GRIFFIN IS HAVING A HUGE ART SHOW TONIGHT! BE THERE OR…BE THERE.